March 24, 2019, age 80, of South St. Paul. Shirley passed away peacefully surrounded by her family. She was an amazing and loving mother, grandmother, and great-grandmother and had a passion for gardening and cooking. Her warm and nurturing heart will truly be missed by all. She is survived by her 4 children, Scott (Diane) Dunagan, Lori (Keith) Meyer, Shelly Anderson (Don) and Jeff Dunagan; 7 grandchildren, Matt (Alex), Ryan (Erin), Brad, Ashley (Bryan), Jenna (Derek), Nick & Tyler; 4 great-granddaughters, Ayla, Madison, Teagan & Annie. Also survived by many relatives and friends. 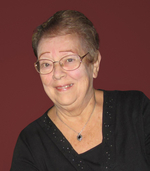 Shirley had a rewarding career at Cenex Harvest States. Funeral Service 11:00 a.m. Friday at KANDT & TETRICK FUNERAL HOME 140 8th Ave No. South St. Paul, Visitation 9:00 to 11:00 a.m. on Friday. Interment Oak Hill Cemetery.